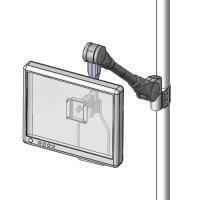 Pole mount lift/lock arm(model #60272P series) - Sallas Industrial Co., Ltd. 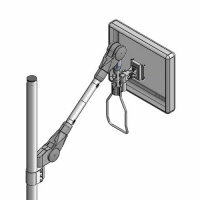 This pole mount Lift & Lock LCD adjustable arm is designed with long reach for holding device from light weight to heavy weight, The design incorporates effortless height, tilt and rotation adjustment of the monitor. Ruggedly constructed from steel arm parts with quality surface plating and provision hooks for cabling. Counter force balanced monitor tilt angle adjustment. 180° arm side to side rotation and 180° display side to side rotation. Wide range of weight capacity from 3 kgs (6.6 lbs) to 15 kgs (33 lbs). Durable heavy duty 2" pole clamp. Conform to the VESA 75mm(standard) or VESA 100mm(optional).